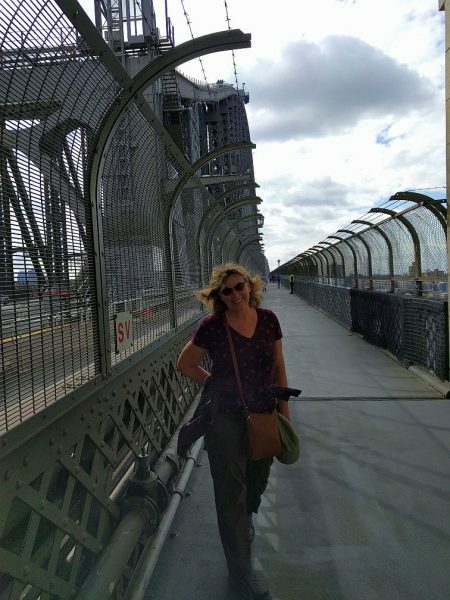 Jeri and I had wanted to get our butts to Australia for some time but it never worked out. Back when we were young and stupid (and might have flown coach) we thought we’d need to stay there a few weeks to make the trip “worth it”. Now that we’re older and wiser (and only fly business or better for long haul) and would do it as a shorter trip, the problem was laying our hands on business class tickets at a reasonable price. Full-on business class award tickets are sorta like unicorns, so our alternative was going to be purchasing coach tickets and using some upgrade certificates we had earned with American Airlines to get us into business. It turned out there were a couple of upgrades already available on the outbound when we bought our coach tickets, so that leg was instantly upgraded. However we would be waitlisted for upgrades on our return to the US. Since the return coach cabin was completely empty when I booked our tickets 10 months in advance, and knowing that American prioritizes upgrade requests based upon the date stamp when they are first requested, I knew we were therefore first in line for upgrades, even if it happened the day of the return flight. This was strategy on my part. But just to be on the safe side I made sure I picked a couple of Main Cabin Extra seats that wouldn’t be horrible if the worst occurred. I just didn’t appreciate that with American Airlines the worst happens with annoying regularity. The overnight flight from LAX to Sydney was pretty good in the 777-300’s mini-cabin, and we got some decent sleep. But at 15 hours, it’s just too damn long. We arrived about 7 AM and at the airport picked up some prepaid Opal transit cards and took the train into town. We must have got to the Hilton around 8:30 AM but of course check in time wasn’t until the afternoon. So they sent us up to the Executive Lounge and we had breakfast. While we were eating, the lounge attendant tracked us down and told us our room was ready. Score! I have to say we’ve been treated pretty well by Hilton. It was really a low energy day, what with jet lag and all, so after cleaning up in the room we just walked around and explored the local neighborhood. Across the street was the beautiful Queen Victoria Building and Hyde Park was just a few blocks away. We also went to Paddy’s Market (sort of a huge, disappointing indoor swap meet) and Chinatown. You know, tourist crap. 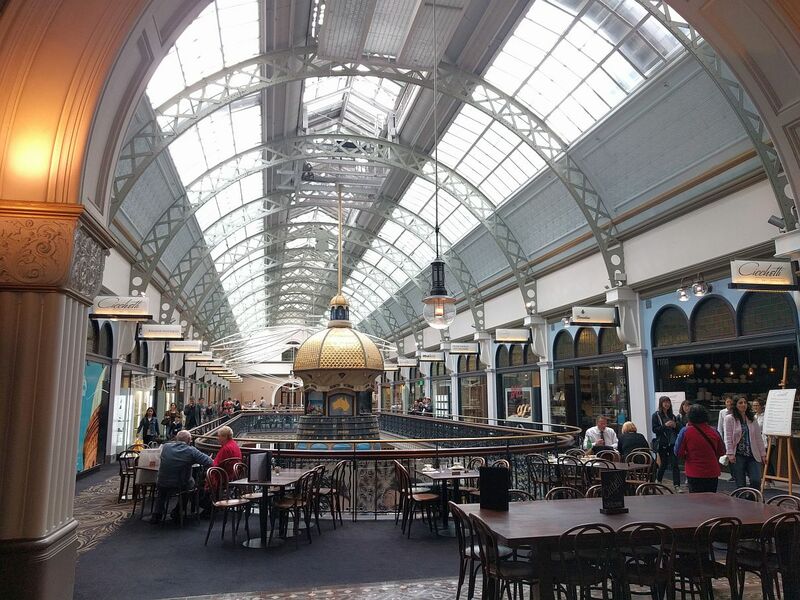 The topmost level (3rd) of the Queen Victoria Building (AKA the “QVB”) across from our hotel. Built in the late 1800s, it’s now filled with a variety of high end shops. A great place to wander around and gawk at stuff. The next morning we took the Metro to Circular Quay to have a look around. Turned out this was also the ferry terminal. On the spur of the moment we decided to hop on a ferry heading out to Manly Beach, which from the map looked like a long, pleasant ride through Sydney Harbour, which it turned out to be. Our Opal cards allowed use to use pretty much any sort of transit, including ferries. 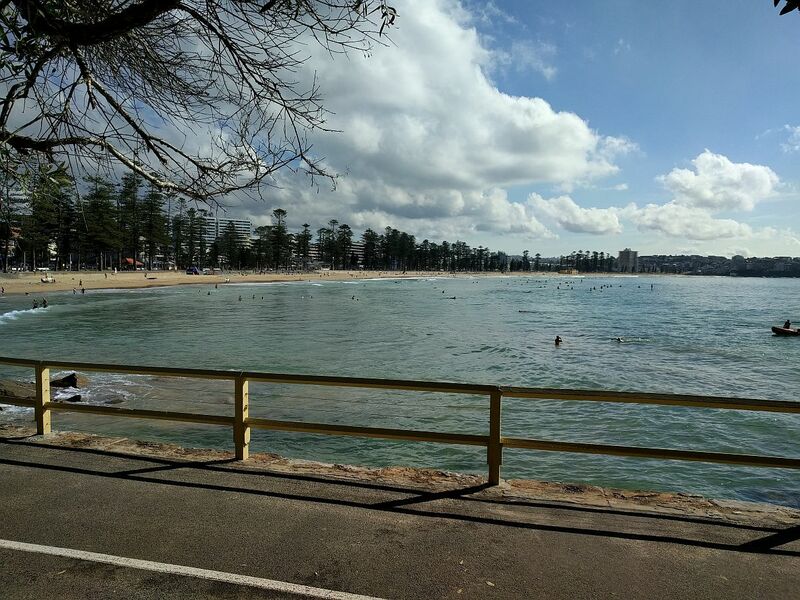 On the pathway along the perimeter of Manly Beach. That inflatable boat on the right is on shark patrol. The Australians are wonderfully casual about it all. Americans could learn a thing or two. We wandered around Manly Beach a bit, which was a refreshing change from the bustle of downtown Sydney. 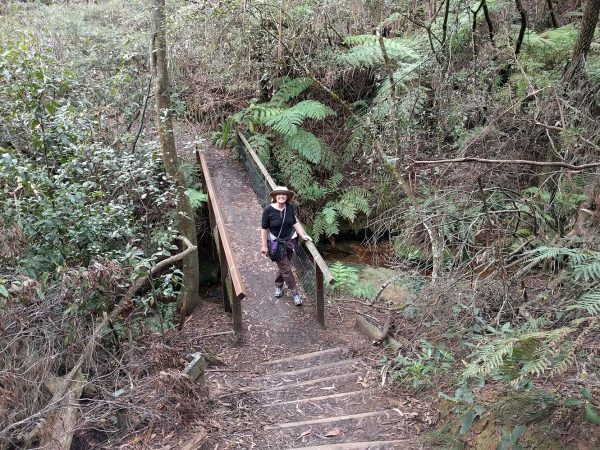 Then we stumbled upon the Sydney Harbour National Park and continued on trails through it. Great ocean views and not many people. 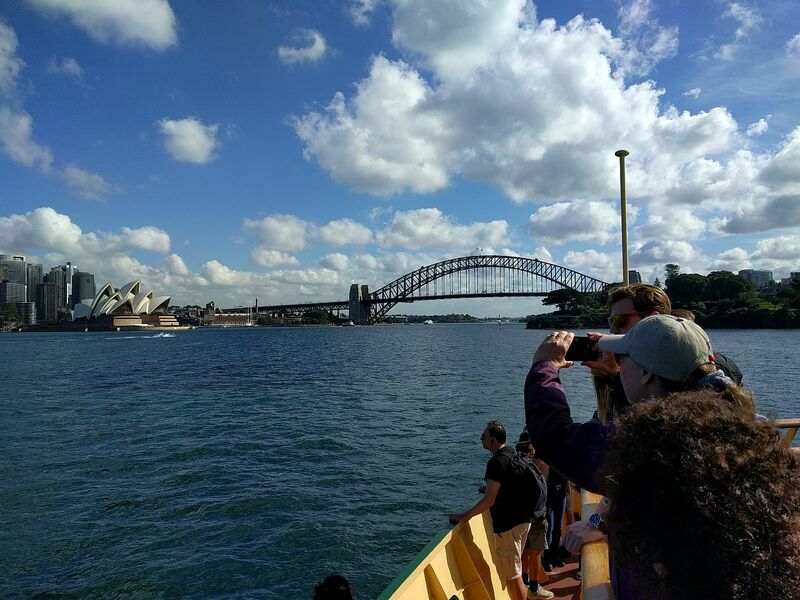 Returning on the ferry, we got spectacular views of both the Sydney Opera House and of Harbour Bridge. 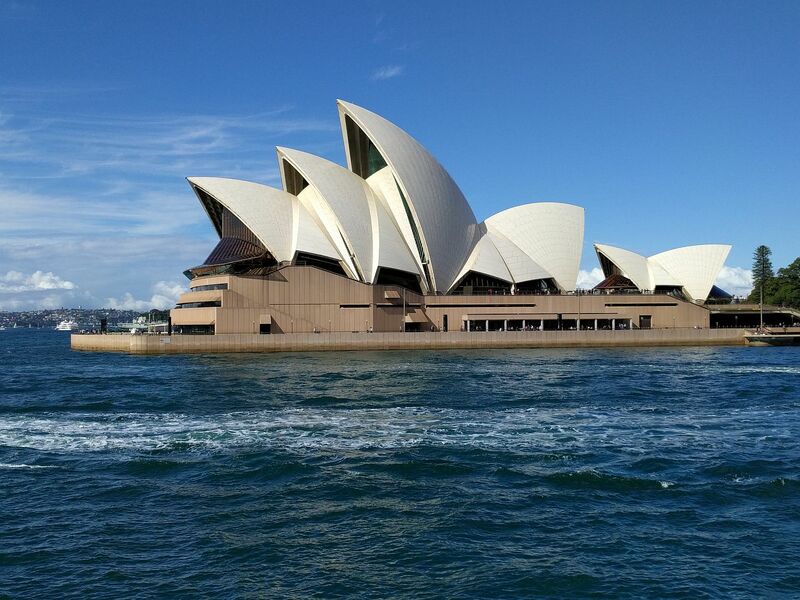 We ended the day by walking back to our hotel by way of the opera house and the Royal Botanic Gardens. Pretty fantastic town! 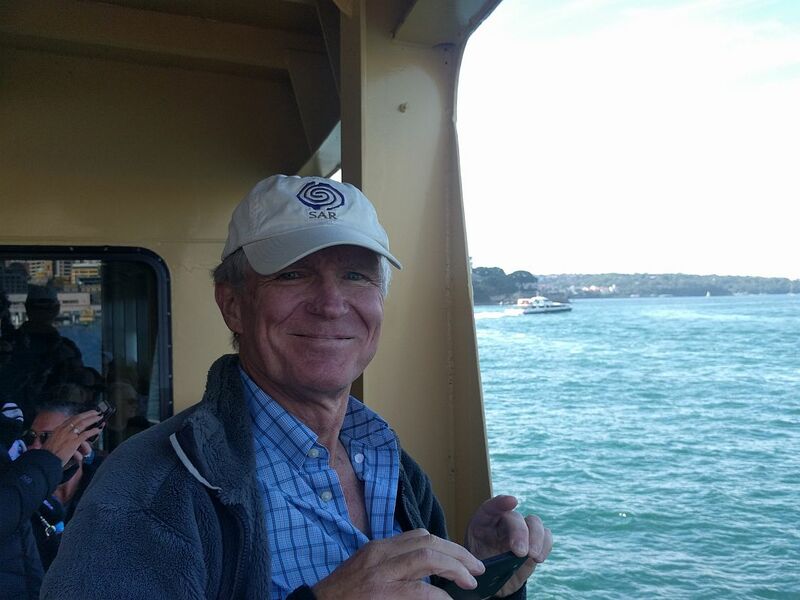 On the ferry returning from Manly because,…. Jeri and her damn camera. Returning on the ferry from Manly Beach one has an overwhelming compulsion to take pictures. For damn good reason. OK, everybody visiting Sydney has to take this picture or they’re fined. So that’s why I did it. There are rules, you know. The next day was kinda a weird day, being Mother’s Day. Different rhythm, and restaurants somewhat packed. However it was a Sunday, which meant the Metro fares were capped at only $2.50 cumulative for the entire day. 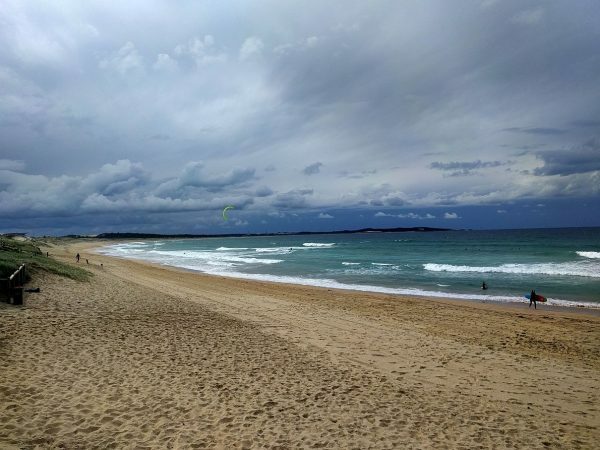 We exploited this bargain by taking a train all the way to its very southerly end, a neat little town called Cronulla. Nice train sightseeing and Cronulla turned out to have a very fine beach. We crapped out there on benches for a couple of hours watching kite surfers in action. The beach at Cronulla where MUCH better men than I are kite surfing. On our return, we stopped at Central Station to figure out how it worked for our departure via train to the Blue Mountains in a few more days. Had some Wagu burgers for dinner then found an amazing bookstore next to the hotel. Killed a lot of hours in that bookstore! The next morning we had a formal Opera House tour scheduled, which was really interesting. I had no idea that thing was designed in the 1950s by essentially a committee. It’s really a timeless structure and to see it up close and personal was really something, as an engineer. Humans can be pretty damn amazing when we really want to do something. Later that day we hit a couple of opal shops and were a bit dismayed not to see any bargains in the land of opals. We followed that up by walking across the Sydney Harbour bridge from south to north, then took the Metro back. Hung out in bookstore again for the afternoon. 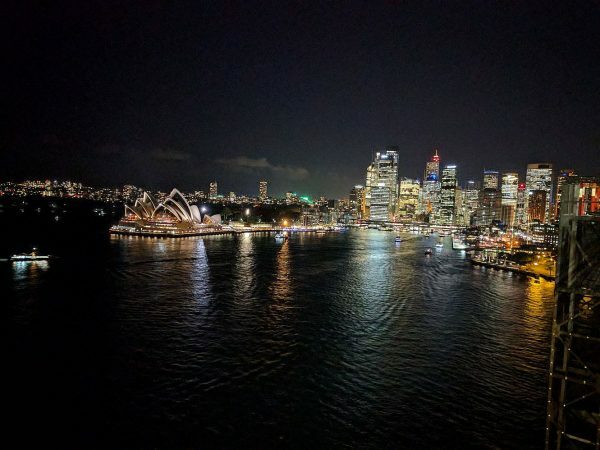 That evening we reversed the bridge walk (this time north to south) walking across the bridge looking at the city lights and opera house. Walking across the Sydney Harbour Bridge. They REALLY don’t want people to jump…. 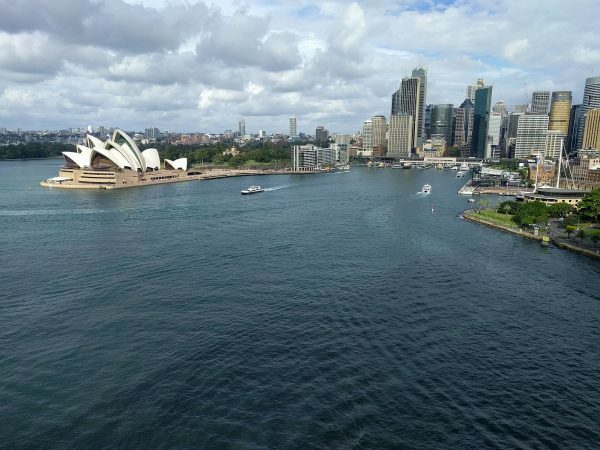 View from the harbor bridge of the opera house and Circular Quay (apparently pronounced “key”) from which the ferry fleet originates. The wunnderful Royal Botanic Gardens are behind the opera house. Hey, it’s the same view at night! I could live here….. The opera house from the bridge at night. I guess you already figured out the night part, right? The next morning we continued to enjoy Sydney’s fantastic transit system (and our Opal cards!) 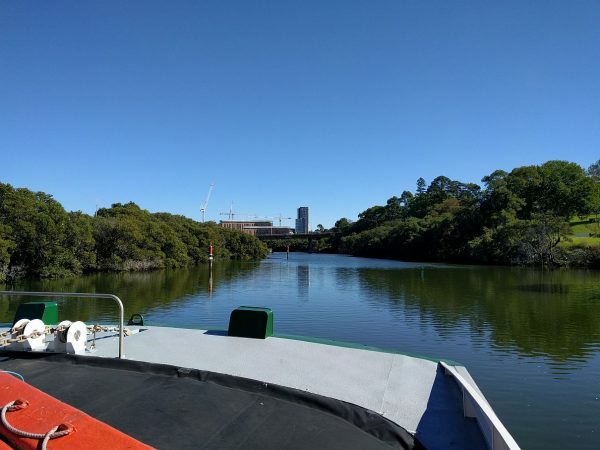 by taking a river ferry far upstream to the town of Parramatta. Wonderful place. We walked around town, had a mediocre pizza then walked over to the train station and caught a train back to Sydney. That afternoon we wandered over to the State Library, then the Royal Botanic Gardens (couldn’t get enough of that place!) 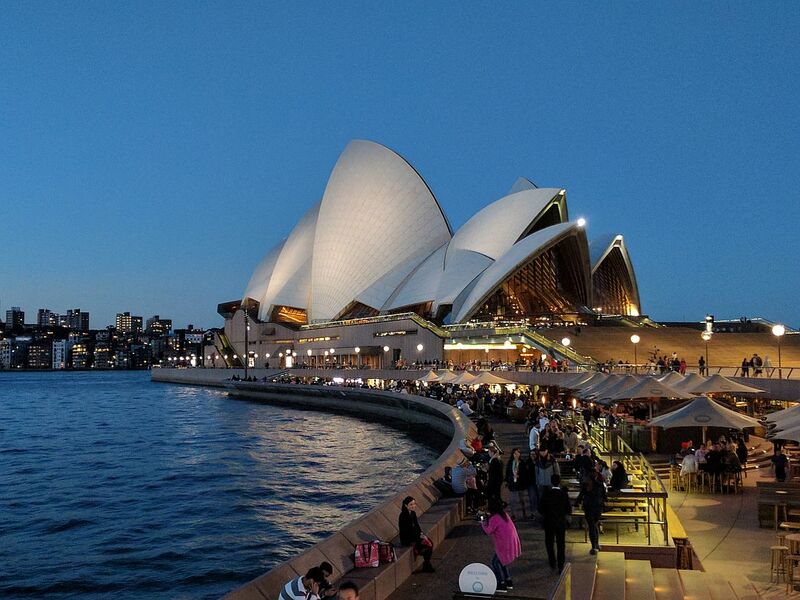 then watched the sun set by the Opera House. Great way to spend a day. Cruising up the Parramatta River on a river ferry. This was an amazingly serene trip that took a couple of hours. And cheap. 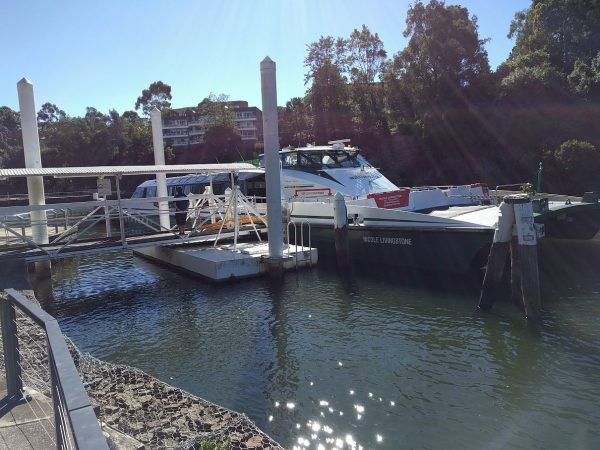 The river ferry at the dock at Parramatta. 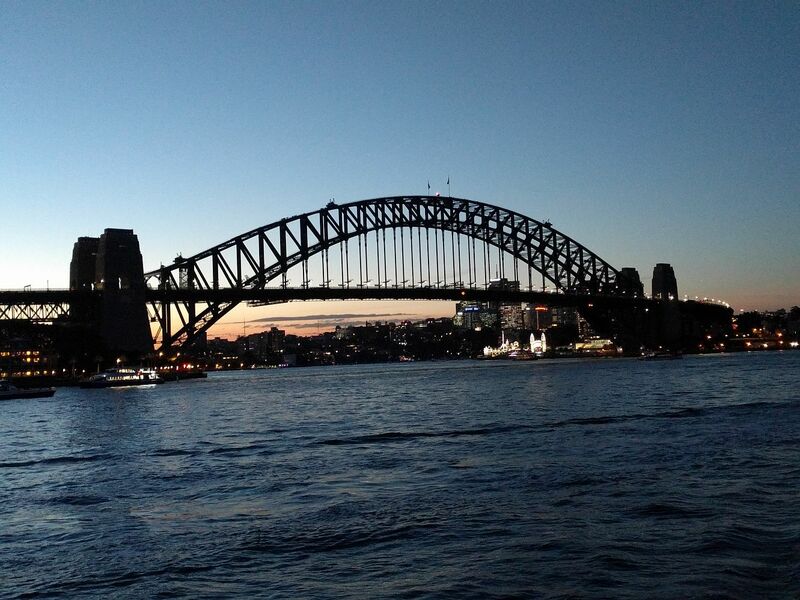 The harbor bridge at sunset. I didn’t know this sucker was built in 1932. I thought it was much newer. The opera house just after sunset because there is absolutely nothing else to take pictures of in Sydney. Our sixth day was a travel day. 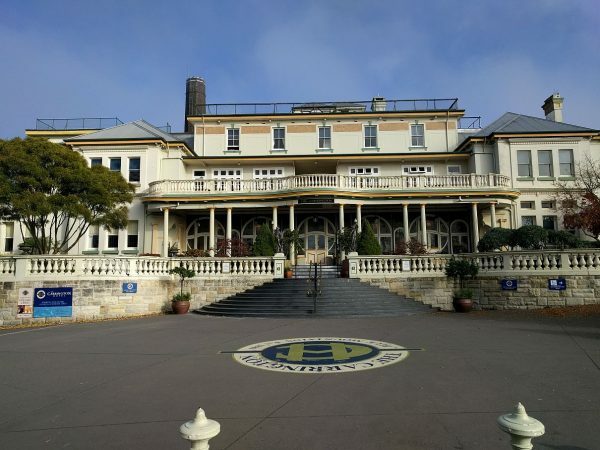 After hitting the Natural History Museum and St. Mary’s Cathedral in the morning, we hopped on a train to Katoomba, two hours west of Sydney in the Blue Mountains. Our next two nights were planned there at “The Carrington” an elegant hotel built in 1883. The classy Carrington Hotel in Katoomba. What’s NOT evident in this picture is that almost everything else in town is well below the hotel, which meant we were always walking uphill on our return. Yeah, cry for us. The next day we did a lot of walking around Katoomba, both on the streets and the many cliff-side hiking trails. 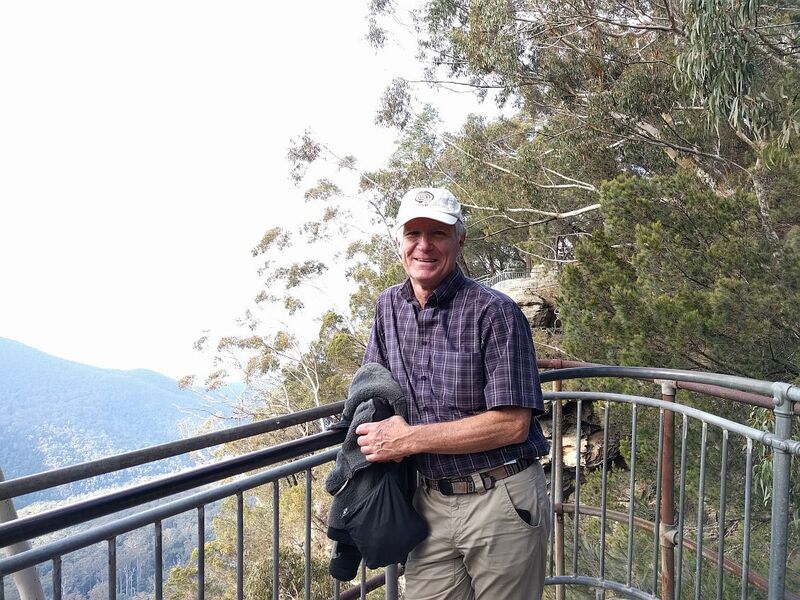 Apparently it’s a major jump off into the Blue Mountains for hikers as there are at least five outdoor gear shops in what is a pretty small town. 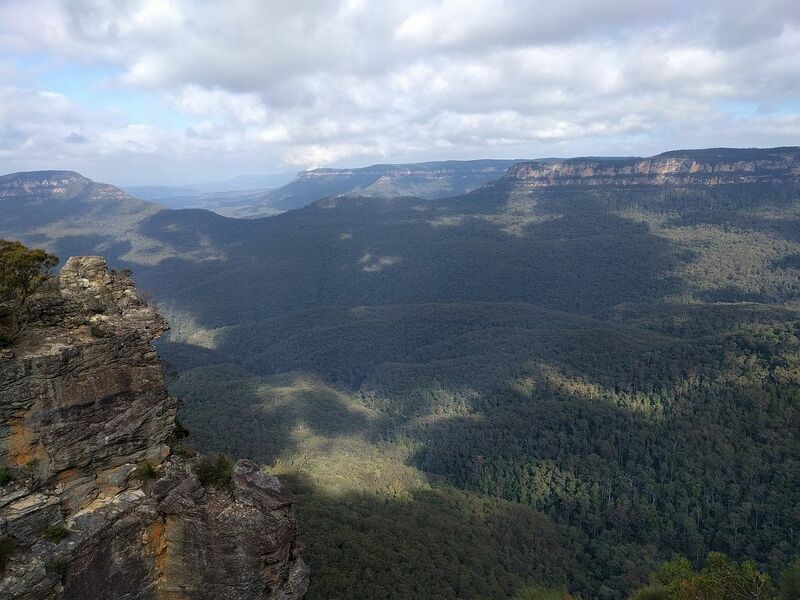 The highlight for us was our hike along the Prince Henry Cliff trail which looked down into the Megalong Valley below, a name which sounds like a place out of Jurassic Park. Actually looked that way too. Some wanker on the cliff trail because Jeri insists on picture taking. We needed our jackets though. A different species of wanker on the cliff trail. Australia is very biodiverse and there are a great number of different wankers. They are considered an invasive species. The Megalonga Valley. This picture can in no way convey how vast this thing is. It’s not just Longa, it’s Megalonga. There could well be dinosaurs down there. The next morning, after breakfast at the Carrington (sounds so classy to be able to say that) we caught a train back to Sydney and dropped our luggage at the Central train station. This freed us up to take a Metro to Government House for a tour (just us and one other person), then lunch at the Royal Botanic Gardens. We then retrieved our luggage and headed to a hotel near airport. 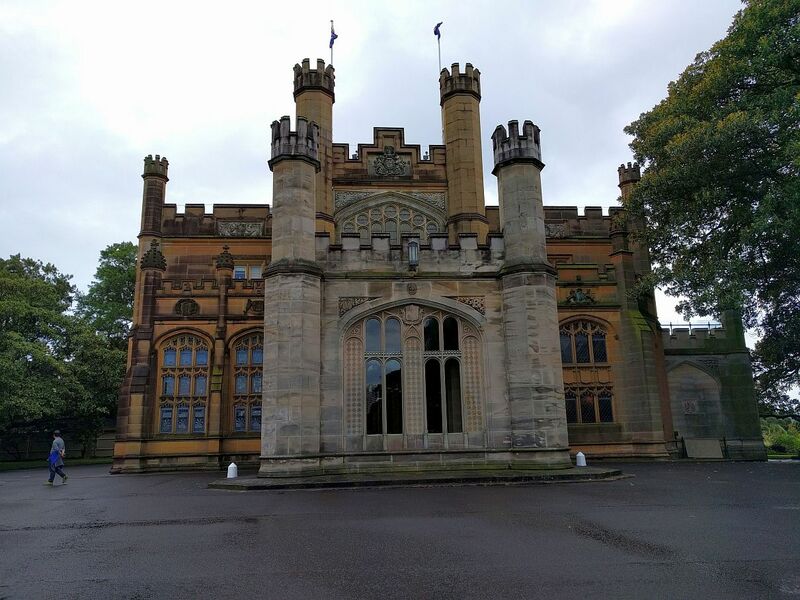 No, it’s not a castle, it’s Government House, the official residence of the Governor-General of Australia. Our guide mentioned that Vice President Pence had visited within the prior month, affording us the opportunity to roll our eyes. 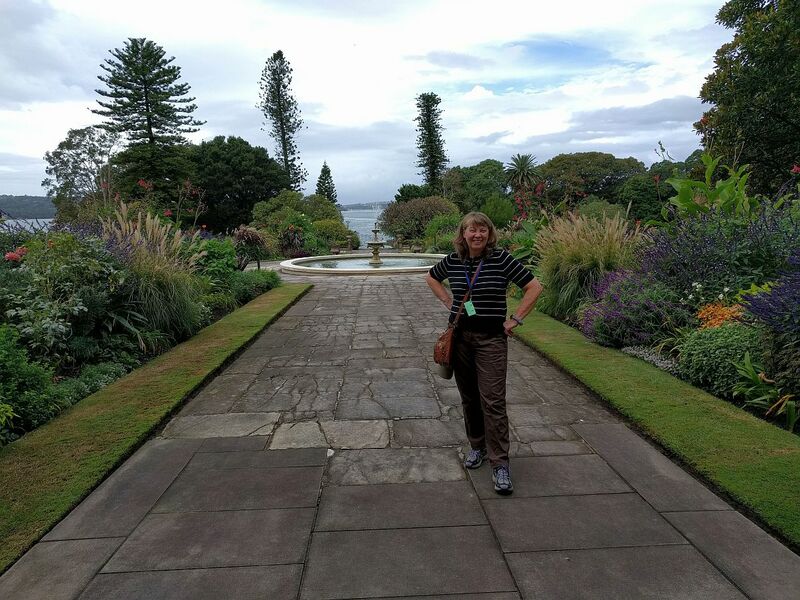 In the Government House gardens, with the Royal Botanic Gardens behind, as well as Sydney Harbour. This being the day before our departure, I was more than a little concerned our upgrade hadn’t yet come through. The business section looked pretty full, but there were still some spots open, and we were well….number one and two on the list. Hah! The morning of our departure I opened my American Airlines app to have a look at the upgrade list which appears four hours before flight departure. Ummm…we weren’t on it, nor had we been upgraded. OK, I thinks….we just won’t be on that list until we actually check in at the airport….but I’m starting to get a bad feeling about this. So we make it to the airport, check in and plant ourselves in the Qantas First lounge (Wow, just wow of a place!). Pulling up the list, I see we are still not on it and business has now been completely filled. Totally confused by all this, I call American’s Executive Platinum Desk in the US to try and make sense of what’s happening. I explained the situation to the agent and also that about a month earlier we had even called to make sure our upgrade requests were still in place and coming out of the proper account (Jeri’s). So the very nice agent tells me, “I don’t know what went wrong, but what I’m seeing on my computer makes me very angry. The upgrade request failed because the system tried to take them out of your account instead of your wife’s, despite the note they were to come out of hers. I’d recommend that as soon as you get back you file a complaint with customer service as this is just wrong.” Very nice agent, extremely apologetic, but there was nothing she could do. So I didn’t screw up, American did, bigly. At this point there was nothing to be done as the business section was now full, so SOL. Turned out our Main Cabin Extra seats weren’t terrible. At 18″ wide with a 36″ pitch they weren’t much worse than flying domestic first class on something like a 737. I had picked the last row of MCE so there wasn’t anyone behind us, which was nice, and Jeri and I had the aisle seats of the middle cluster of three seats. We had a low maintenance man of small stature between us, so it was all reasonably comfortable. Food was surprisingly good and the bathrooms were kept cleaner than those in the business section of our outbound flight. Finally, it was a daytime flight, so no sleeping necessary. So our return wasn’t as bad as we had feared, despite American’s incompetence. Yeah, yeah, I know….we are spoiled silly in our travel. I’m more than willing to own that. We paid our dues when young, with crazy-cheap travel arrangements I can only look back on in disbelief. But we don’t do that anymore, since for us, travel is completely discretional. We do it in comfort, or we don’t go. There are too many other fun things to spend money on. Oh….I never did bother to contact American about their screwup after our return. They would have just told me that upgrades are never guaranteed and we did, in fact, get the class of travel we paid for. I know these guys. In the end they would have offered up some amount of AA miles as “compensation” for our situation. However since Jeri and I are doing our best to burn our existing stash of AA miles and disentangle ourselves from this airline, the last thing we want is more miles. Two more long haul trips with these yahoos and we’re done with them. 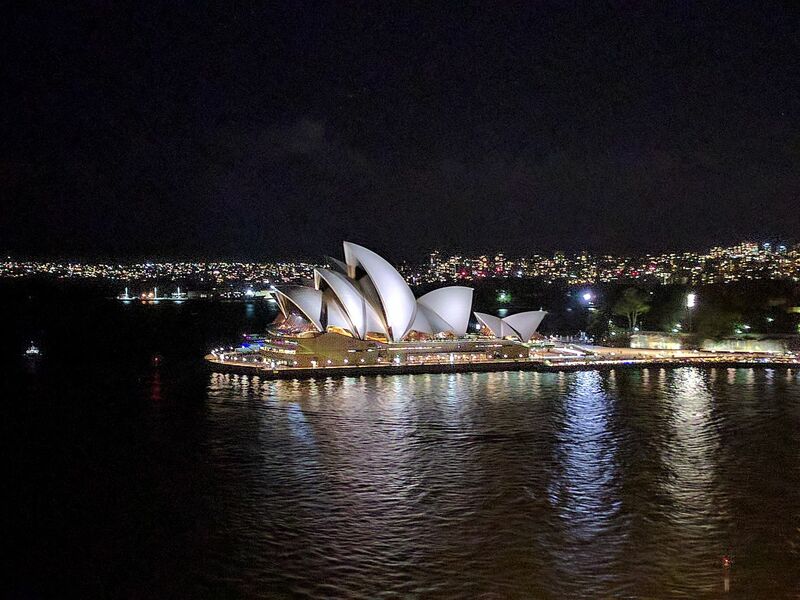 Travel screwups aside, we enjoyed our visit to Australia immensely. The climate seemed to us very reminiscent of Southern California, which was likely part of its attraction. Come the Australian summer, we might have a different opinion. We really enjoyed the sensibilities of the Australians, and their wicked sense of humor. They live in a land full of critters and other things that just want to kill them every which way, yet they just shrug it off and go about their daily business. Americans could learn a lot from the Australians.